Reviews of our repair service. We don't chase people for reviews which is probably why we only have a few hundred out of the thousands of repairs we have completed. We feel this means that people that have felt compelled to write a review, have done so completely off their own back and therefore the quality of the review is better. 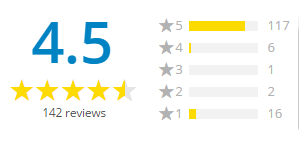 Customers have naturally flocked to Google, Yell.com or used our repair pages to write their own reviews. We have no power to moderate the reviews on these sites. Links to the relevant sites are displayed below and you can follow the links to leave your own review if you so wish. We have review sections on every repair page of our site. Just click on any repair, and the reviews are listed at the bottom of the main description. You can leave your own on there too.